The 2020 Kia Sportage doesn’t feature as much of a dramatic redesign as the upcoming 2020 Kia Soul. However, the exterior and interior adjustments are notable and welcome changes to the style of the Sportage model. 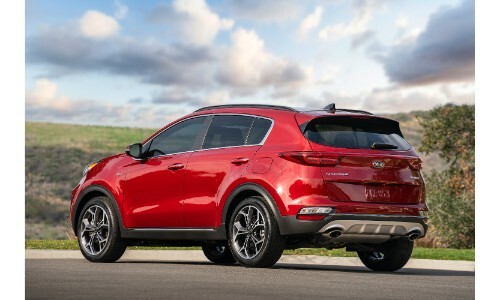 For a detailed look at rest of the available features of the 2020 Kia Sportage, please see here. The 2020 Kia Sportage has a confirmed spring 2019 release date. This likely will happen after the release of the 2020 Kia Telluride, theorized for March 2019, due to the Telluride’s level of current buzz and marketing push. However, it will come before the summer 2019 release date of the redesigned 2020 Kia Soul. Expect an April 2019 or May 2019 release date for the 2020 Kia Sportage. For more information on the upcoming 2020 Kia Sportage SUV, please contact us. We’d be happy to answer any additional questions you might have. The staff of Palmen Kia can be reached online, by phone, or in person at our dealership located in Kenosha, Wisconsin. How Powerful and Capable is the 2020 Kia Telluride SUV? What Trim Levels are Available for the 2019 Kia Sportage? This entry was posted on Thursday, February 7th, 2019 at 5:12 pm	and is filed under Kia Sportage, News. You can follow any responses to this entry through the RSS 2.0 feed. You can skip to the end and leave a response. Pinging is currently not allowed.